I have to start in on con reports, although 4 in a row kinda is daunting. And so… not today. But huge. HUGE! I mean, they are asking other labs to double-check first, but the finding: neutrinos can travel faster than light. Amazing. Even breathtaking. I mean, it’s no greased dark light speed, but what is? Of course, I’ve read some articles saying that it shows we can travel back in time, and I’m just not yet buying that. I mean, already we’ve found that on the atomic level things don’t confirm to normal physics in other ways. but whatever, who knows. It’s still frikkin’ amazing. I love Potty-Bot. Clearly Pierrot is choosing wrong. Half way? Is that literal? Is this half way over … forever? 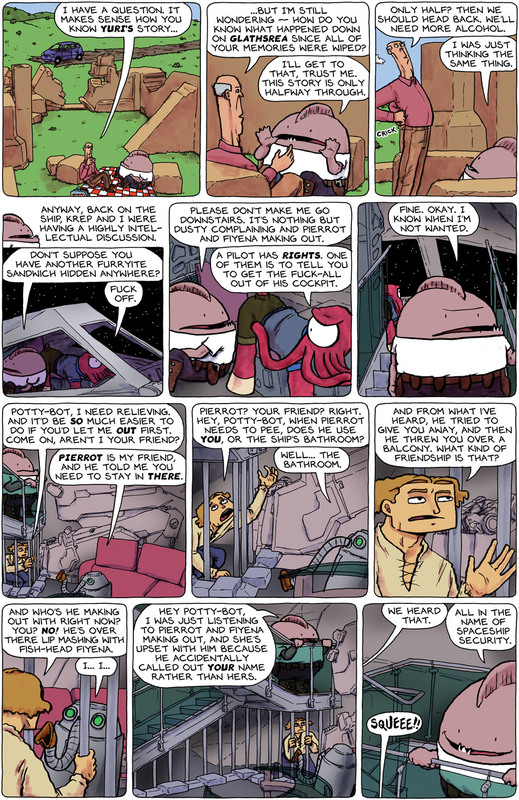 *sob* *choke* I want SpaceTrawler to last FOREVER!!! Nogg’s recount may be half over, but I’d wager the story will continue on after he is done. Whew. I was beginning to think Dusty was smarter than I thought. I wouldn’t get too excited about the neutrinos. If you mouse-over the comic, there is an alt-text that is worth reading as well. @Nemo: There are far more exclamation points in that article than sanity would permit. Otherwise, a good piece. Bah. I believe that if humanity ever develops the ability to travel back in time some idiot of the future would/will (have) screw(ed) up and we’d have found out by now. Our present is screwed up thanks to future time travelers messing with the past. Case in point: the premature cancellation of Firefly. In some alternate future, our culture is dominated by browncoats. Something had to be done! Actually, what CERN is suggesting is that we could send information back through time, not us. What this means is, well I’ll just say “Thiotimoline”, except that the “batteries” needed to send one bit of information back would probably have to be the size of a country. As for todays comic, has Nogg ever heard of the NSA? @Nemo, excellent link. Yes, I will definitely await further verification, but it’s still damn exciting. @Frank…. U’m you lost me on NSA. National Security Agency? No Strings Attached? @Christopher, I think Frank’s “NSA” comment is referring to spreading disinformation in order to maintain security. The potty-bot is the creepiest thing in Spacetrawler up to now. About the neutrinos, I prefer Nukees take on it. Our neutrino detectors are not flooded with soft-drink advertisements from the future, hence no faster-than-light neutrinos. I really want Potty bot to meet a bidet and fall in love. This is my new goal. @Thomas S: Plus there’s that whole reverse toilet thing down there.